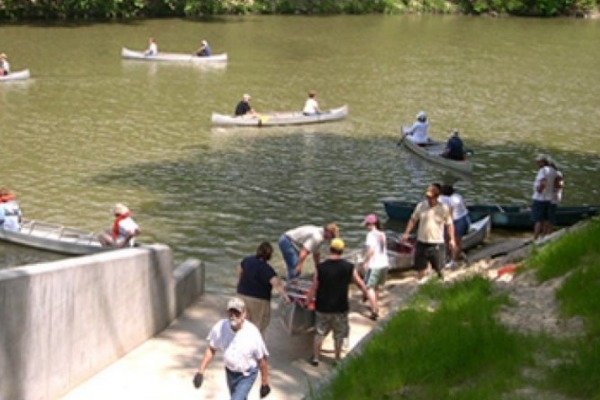 We will put-in at the Jesse Jones Park Canoe Launch at Spring Creek. Directions --If coming from Houston, take the Eastex Freeway (aka US-59 / I-69) to Humble. Exit left (over the flyover) on FM-1960. Drive West for 1.6 miles, turn right on Kenswick Dr. Drive about 15 blocks or 1.25 miles to the park entrance. Take a few minutes to check out the visitor center. I will have a permit to put in. We can drive to the put-in, drop off our boats and paddling gear, drive up to the parking area, and walk back 650 yards to the creek put-in. Sorry, no trailers, just roof-rack or truck-bed mounted paddle craft. Canoes are OK. Hazards -- May have some shallow areas, I will work to avoid crossing any. If there has been Zero rainfall, I may cancel the trip.